There are Broadway stars that shine on stage and then there are Broadway personalities that shine on social media, which makes Annoying Actor Friend (@Actor_Friend) the Patti LuPone of Twitterverse—and just like Patti, @Actor_Friend has a fabulous, best-selling book title #SOBLESSED. To celebrate the book’s success, @Actor_Friend has gathered 12 of his closest friends (we assume, since no one knows who he actually is…and if it were a she, she’d be @Actress_Friend, right?) on September 20 for a one-night-only concert adaptation of the book, complete with a drinking game and a ton of showbiz stories—think drunk Chorus Line but without the dance belts. All the proceeds go to the wonderful Broadway charity BC/EFA, and there might even be an appearance by the person behind the Twitter handle. 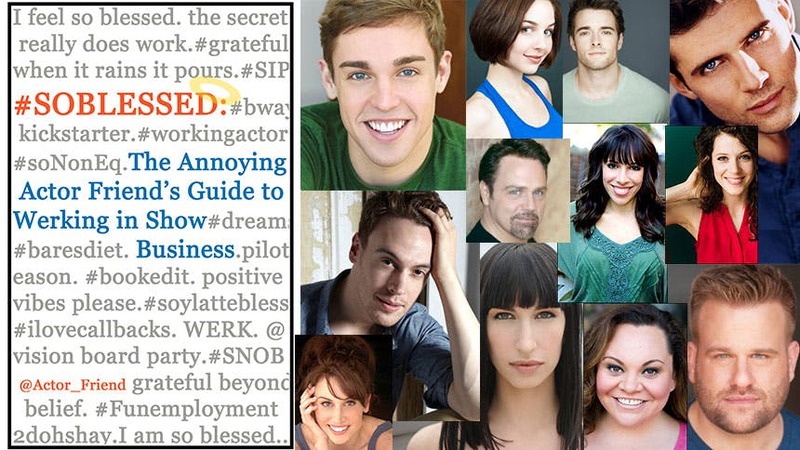 Below, @Actor_Friend helps all you future aspiring actor friends by sharing with BroadwayBox 10 #NOTBLESSED things that will happen to any eager Judy Turner or jaded Sheila Bryant working on Broadway and the #BLESSED way to react. We all have that friend we love to hate. There's a good chance we ARE that friend to most people! When an actor friend has so many #blessings to share on social media that it drives you crazy, the #notblessed thing to do is hate-watch them. Sure, it can be fun for a while, but eventually it will eat at you with the ferocious desperation of a dancer five minutes after Broadway Bares ends. I suggest the #blessed approach to handling an annoying over-sharer be that of an unfollow on Facebook and a mute on Twitter. They'll never know! Actors are more often in a rut than anything else. But you can't let the Internet know that! So, what do you do when your career is in a downjan ward-spiral and you can't find anything to make your online character look successful? Develop a new brand! Maybe it's time to shift your focus to something your friends and followers might actually be engaged in. Find something you love to talk about and become the go-to opinion on that subject. Or just post a bunch of pictures of anything that happens in your day that LOOKS fun. Tricking your friends online into thinking you have the best life ever is easier than 5-6-7-WAIT-what's-the-number-for-unemployment-again? Accompanists will occasionally mess up your tempo and readers are known to sometimes skip lines on a page. If this happens, take a moment, and say you have #BlessedRequest. Then politely ask if you can take it from the top, and point out that you gave the wrong tempo or skipped a line. This puts the blame on you, but a #BlessedRequest lets them know they EFFED IT UP. "Hey! What are you here for?" "Doing a reading down the hall. We're here all week." "It's so good to see you, though!" The professional thing would be to engage this actor in a congratulatory manner. The #blessed are never stressed, and always remain non-confrontational. But you know what? In this case, I suggest keeping a collection of Liz Lemon eye-roll GIFs (there are hundreds on Google) and showing it to your actor friend before they step off the elevator. If you want to be on time for anything, you should probably just move to 43rd Street between 8th and 9th. But if you must live elsewhere, the MTA is going to have something to say about it. If the trains decide to mess up your chances of making a callback, don't have a public meltdown! Instead, hop on Twitter and see where all your other friends are stuck along the way. This especially applies to those living in Astoria. There's bound to be an actor held at each stop, and you'll be able to decipher cause of the traffic by their tweets. This is true. There is no doubt about this. Everyone on Broadway will agree with you. That is why only they are the people the #blessed can commiserate with. Why? Because #7. This is truer. There is even less doubt about this. Everyone Not on Broadway will agree with you. The #blessed way to approach this horribleness is to keep working at it, and eventually you'll be #werking. Then you'll be right back at #6. Sometimes you'll be in a show, and then it will go to Broadway, and you won't be asked to join it. When that happens, the Powers That Be deserve a big fat #BLOWME. But, you're a #blessed actor, and thus you must hold that emotion deep inside you until you can use it for when you do Mother Courage. I call this a typical Thursday. You're going to want to quit. But that's true for any career. The #blessed way to approach this dilemma is to decide if this is the only profession you can pursue where you'll always be able to win that battle every time. Should you ever get bored with the life of an actor, then you're probably doing it wrong. But, if that truly is the case and you still want to do it, then the #blessed way to handle the boredom is finding out why you pursued it in the first place. And also, try not to complain in an open forum because you will always turn-off those less successful than you. Actors must always know their audience. Don’t miss all the stars and their stories in @Actor_Friend @54below on September 20. And who knows, maybe you’ll gain some new Twitter followers out of the night.